It’s the presence of others who are smarter, kinder, wiser, and different from you that enables you to evolve. Those are the people to surround yourself with at all times. innovAGEING (iA) has just marked its first year anniversary as Australia’s national innovation network for the age services industry—a good time to remind ourselves that great innovation doesn’t occur in a vacuum, and true innovation rarely ever happens by chance. Combine this with urgent industry pressures, such as the need to respond to reform challenges, capture new market opportunities, meet changing consumer preferences, and invest in technologies that allow providers to be wired to care—the innovation imperative in our industry is unequivocal, and the need for a true aged care innovation network is undeniable. Reinterpret the concept of ageing in relation to the design and delivery of services. Foster the development of new business models through innovation. Enable the industry to be more consumer-centric in its service delivery. As an innovation network, iA has stewardship and curation responsibilities—addressing organisational challenges in aged care is in our DNA. In essence, we are a community of practice, sharing ideas and working together to solve complex industry problems. Being empathetic is good for business. Disruption is not just about technology changing, but also organisations changing the logic of their business. Sales is an important innovation element equal to developing services and products. Innovation is not a lottery, and needs to be grounded in the ‘how’ as much as the ‘wow’. Disruption is a commercial endeavour of incumbent organisations, not just start-ups. Technology adoption is a tool to design an ageing trajectory that improves well-being and opportunities for older Australians. The first aged care nudgeathon in Australia, co-hosted with iA Gold Partner, Alive Co (part of the Mirus Group). Launching the country’s first aged care open innovation lab in collaboration with iA Gold Partner, KontentLabs. 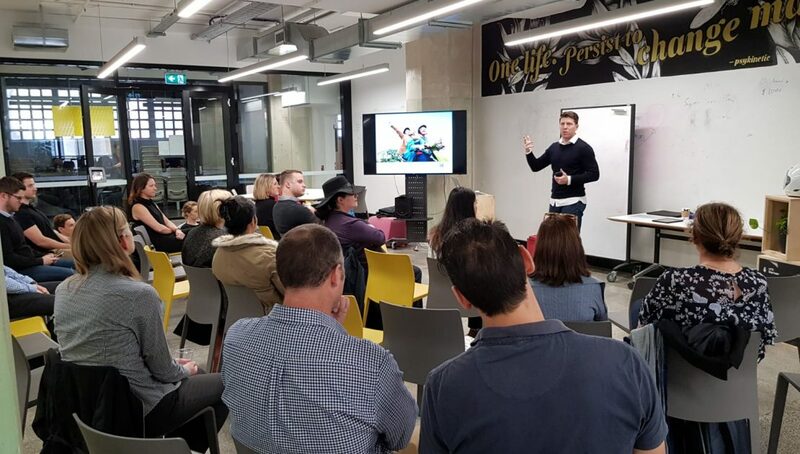 A meetup bringing together up to 159 people from the aged care industry and start-ups community co-hosted by Peak15 HealthTech and iA Knowledge Alliance member, RMIT University. Delivering a future of aged care design thinking workshop with—iA network participant and social impact design agency—Ellis Jones. Co-hosting an innovation and diversity forum focusing on bridging the divide between research, policy, and practice with the University of Western Australia, MYVISTA, Local Government Professionals, and Fortis PICAC WA. Bringing aged care innovation directly to approximately 2,000 older Australians at LASA’s 2018 Care and Ageing Expo, through sponsorship and curation of the Expo’s innovation chat lounge. It really is incredible what a difference a year makes, and to get a sense of the rich exchange of ideas currently underway in our industry, a quick review of the Innovation Hub speaker’s program at LASA’s National Congress in Adelaide shows the panoply of the impressive ideas and initiatives underway in aged care. Likewise, a headcount of the attendees at the Innovation Hub presentation sessions and panel discussions, and approximately half of National Congress attendees visited the Hub at least once over two days. Moving ahead, iA is collaborating with its Foundation Partners—the Commonwealth Bank and KPMG—to deliver a national aged care innovation awards program, and the innovAGEING Olympics in 2019. We’ll continue to work with our network participants, listen to their wants and needs, promote their hard work, and celebrate their wins. Looking to the future, as we move beyond the one-year mark, iA is acutely aware that what we do next matters far more than what we’ve already done. To learn more about innovAGEING visit here. To join the innovAGEING Open Lab visit here.